Imagine yourself in a world where software processes determine every aspect of your existence—what you think, where you go, whether you live or die. Imagine that each program in this computer world is the alter ego of some human programmer in another dimension. Imagine a world in which video games are live battles, where file manipulation is behavior control—where simulation is reality. Some might argue that we are already approaching such a world. Computers are taking more and more functions away from human operators in the factory, in the marketplace and on the battlefield. It’s becoming hard to tell where human supervision ceases and where computer control begins. But there’s still room to fantasize about what really goes on inside the processor-minds of our computer colleagues. Can they outthink us? Do they ever wonder about us? Walt Disney Productions, Burbank, CA, will give summer movie audiences the chance to ponder these questions when a futuristic adventure film, Tron, is released next month. Tron portrays computers in two domains: in a large communications company in the real world and in a micro-civilization existing within the electronic circuitry of a computer. Even more significant than the subject matter is the computer technology used in producing the film. The animation and computer-generated scenery for the film are the most advanced ever used in a commercial motion picture. Live actors are merged with computer graphics in a technique being touted by Disney as a milestone in optical and light effects. The film has been in post-production special effects processing for over a year. The company responsible for producing the majority of the computer animation is Information International Inc. (1.1.1. ), Culver City, CA. I.I.I, has been involved with digital simulation for motion pictures for several years, having recorded major scenes in such feature films as Futureworld, and it has a $3 million facility devoted to scene simulation technology. Richard Taylor, director of the company’s digital scene simulation division, oversees the design and programming of computer animation in Tron. “The film will make computer simulation a household word,” he says enthusiastically. “The animation is hypnotic. It has a perfectness that communicates subliminally to the audience.” Before joining this firm, Taylor was creative director for Robert Abel and Associates, where he won four Clio awards for excellence in television commercial production. The film’s director is Steven Lisberger, who is making his debut as a live-action director. 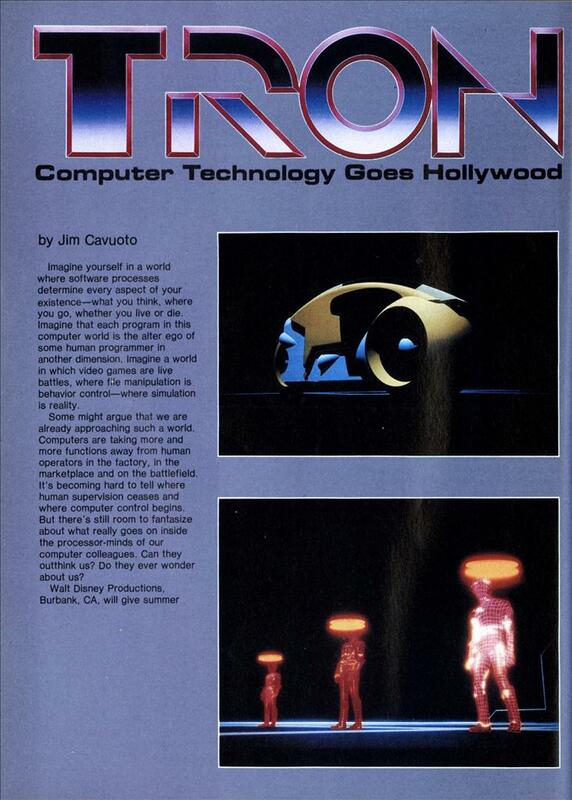 The idea for Tron came from his fascination with video games. The film stars Jeff Bridges, David Warner, Bruce Boxleitner and Cindy Morgan. The story begins when a young computer expert and video arcade athlete decides to take on a large computer corporation he suspects of software piracy. A menacing control program gets in his way, however, and he finds himself in an electronic domain in which he must fight battles on a brutal video game grid. It is in this surrealistic computer dimension that the digital scene simulation really shines. One third of the backgrounds are computer-generated, requiring that each artificial landscape be properly joined with the live-action frames. “The entire film uses backlighting, not reflected light,” explained Taylor. “As a result, each character is made out of pure light.” Multiple camera passes, anywhere from 12 to 20, are made to create a high-contrast image. Color gels are used in a process Taylor likens to “painting by number.” Between 5 million and 75 million calculations are required to create one frame of animation. It can take from 15 minutes to an hour to create a frame. Considering that 1,240 frames make up one minute of film, this gives some idea about the complexity of the task. I.I.I, has developed a four-stage process for developing simulation scenes for films and television commercials. The first stage is design, which involves coming up with an idea and creating a story-board. The next phase is data entry, which can be done in one of three ways. The most prevalent is encoding by hand, whereby the designer generates two orthogonal views of a scene, then uses three cursors to encode points in three-dimensional space. A second method, used for well-behaved geometric shapes, is algorithmic, or mathematical description. The third technique is picture scanning, which is used to add texture to three-dimensional surfaces. After all the data describing a scene has been entered into the computer, I.I.I, uses its proprietary Director’s Language to further specify the image. Size, color, orientation, lighting, reflections and textures can be easily manipulated with this interactive language. All the scene characteristics a studio production company would normally use on a set are accessible with Director’s Language. The fourth and final stage of the simulation process is filming, which uses a high-resolution electronic imaging camera in conjunction with a precision graphics recorder. The main computer used is a Foonley F-1, which Taylor describes as a “souped-up” PDP-10. An auxiliary high-speed, 36-bit computer with 512 bytes of memory available gives the system its high performance. This computer is 10 times faster than the PDP-10. Other hardware making up the image processing system includes two programmable film readers, a 40-in. by 60-in. Taylos graphics tablet and various display monitors. Magi, Inc., Elmsford, NY, which is assisting I.I.I, in the simulation for Tron, uses a Perkin Elmer 3240 computer with 2M bytes of memory and two 80M-byte disk drives. A Celco CFR 4000 computer generates Magi’s pictures on a monitor. He also foresees the need for increased computational ability to get more realistic imagery and movement. One area that would benefit from greater processing speeds would be the simulation of the human form. At this point, stylized human beings can be created for medium or long shots, but a realistic close-up portrait of the human face—complete with hairs and pores—is beyond the power of computer simulation. Taylor feels it will be 10 years before this challenge is met. Aside from the movie’s superb graphics and special effects, Tron is likely to attract throngs of first-time and repeat viewers because of its subject matter—video games. Video arcade games took in about $5 billion in revenue last year, and their popularity is still growing. Ironically, the most successful video game, Space Invaders, grosses $600 million each year, three times the income of the most successful movie in history, Star Wars. That fact is obviously not lost on Bally Manufacturing, the nation’s largest video arcade game maker, who have introduced a Tron video game and will be placing the game in theaters showing the movie. Meanwhile, Disney accountants will undoubtedly be scrutinizing boxoffice returns, In the hope that computer technology will emerge as the next science fiction formula to challenge the astronomical Star Wars grosses. ? Alan B. — member — Indpendent Film Association of So. AZ. Amazing isn’t it, the computing power used to make the movie wouldn’t cut it today for a chinese iPhone clone! Still most of the movie wasn’t computer generated, just looked like it. Wow, 512 bytes of memory. That Foonley F-1 is powerful. 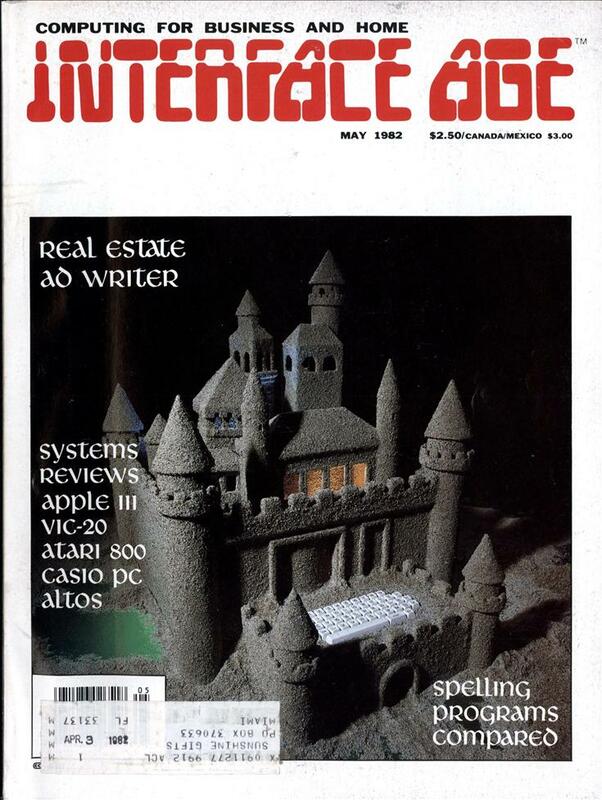 ‘Tis a silly comment, but I got a warm feeling when I saw this posted, because I recall buying a copy of that issue of Interface Age simply because I leafed through it in the store and saw the TRON article! I’m not sure that is a misprint. They call it an “auxillary computer” but I’m thinking in actuality this was probably more like a vector processing unit. These would out of necessity have a very high speed RAM (and a small amount because of expense.) Vector processing units didn’t (and don’t ) need a lot of RAM — when it’s time to run a mathematical transform on, say, 10,000 data points, JUST that loop would be loaded onto the vector processor. It’d churn through those 10,000 points from main memory while the main CPU can possibly do something else. So, there were 4/5 companies overall that worked on Tron. III and Magi the article talks about. Digital Effects used an (off-site) Amdahl V6 for some intermediate steps (using software written in APL) and final rendering on an (also off-site) IBM 370. Digital Productions split off from III due to disagreements mid-film, and used leased time on a Cray 1. Robert Abel and Associates used a DEC VAX.